Thrust into the cockpit of a Naboo starfighter, young Anakin Skywalker unwittingly finds himself in the midst of an interstellar dogfight with Trade Federation droid fighters while heading straight for the droid control ship. 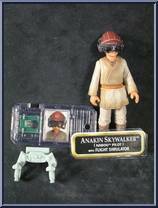 Contribute pictures, update details or suggest corrections for Anakin Skywalker (Naboo Pilot). Write a review about Anakin Skywalker (Naboo Pilot).